Solid additions to payrolls in April put the U.S. labor market back on track and eased concerns that may have arisen following the poor hiring results in March and a weaker than anticipated initial reading of GDP. 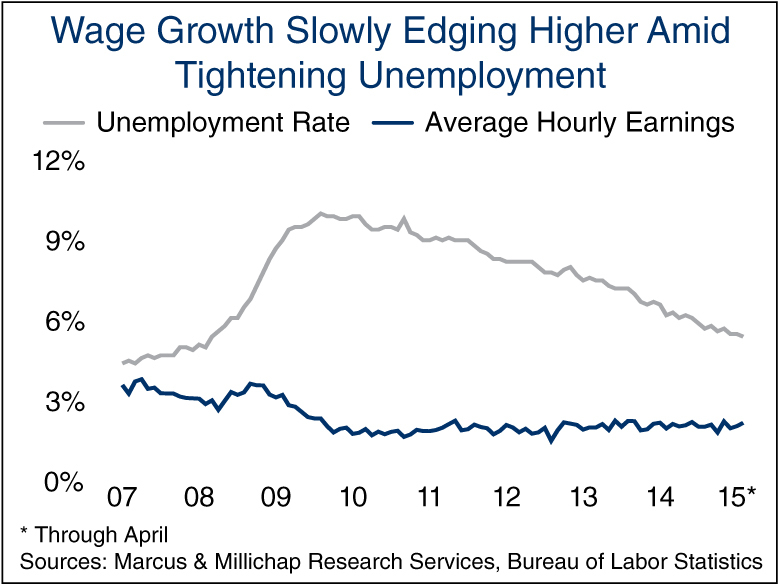 The further tightening of the labor market and the likelihood that economic growth will accelerate as 2015 progresses will likely encourage the Federal Reserve to raise its benchmark lending rate in the fourth quarter this year. In the meantime, low interest rates and subdued inflation will continue to support consumers’ spending power and will underpin a respectable pace of economic growth in the months ahead. U.S. employers added 223,000 jobs last month, including 213,000 positions in the private sector. Most private-employment sectors accelerated hiring in April from the prior month, a trend exemplified by the creation of 45,000 construction jobs following staff cuts in March. Warmer weather allowed developers to initiate several projects, elevating multifamily development from its already strong pace, and sparking additional office, retail and lodging building. Professional and business services employment also grew by 62,000 positions in April; workers have been added each month for the past five years. Manufacturing payrolls have been flat for the past two months as exports were curtailed by the stymied West Coast port activity and the strong dollar. However, rising factory orders may lead to increased hiring. The U.S. labor market is tightening, drawing down the overall unemployment rate to its lowest level in nearly eight years in April, to 5.4 percent. The underemployment rate that counts part-time workers seeking full-time positions continued to tighten, slipping to 10.8 percent, also a post-recession low. A shrinking pool of the unemployed, however, has yet to translate to substantial wage growth, with the average hourly wage in the private sector up a nominal 2.2 percent year over year through April. Wages have grown an average 1.9 percent over the past two years, but a faster pace of growth will slowly manifest over the coming year. Retailers created more than 12,000 positions in April, about half of the total recorded in the preceding month. The retail sector still has not received a significant bump from the lower gas prices that have persisted throughout this year, although a recent increase in credit-card debt suggests that consumers may be loosening up. Despite the missing surge in consumption, the retail sector continues to log solid performance, with U.S. vacancy forecast to tumble 60 basis points this year to 6.0 percent. Completions will total just 47 million square feet and will be inadequate to meet retailer needs, so an upswing in development may finally be forming. Steady employment gains are sparking the formation of new households and sustaining the vigorous performance of the U.S. multifamily market. This year, national vacancy will edge up to 4.8 percent as 250,000 new units marginally outpace net absorption. Approximately half of the construction will be in 10 key metros, which could face short-term vacancy increases, but other markets will see little slowing.